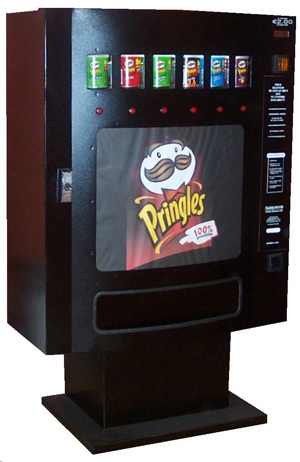 The PR2000 machine is designed to vend the 43g tubs of Pringles. It proves an extremely successful machine for a variety of locations and sites. This 6 Selection machine can hold 96 tins in total so is ideal for sites with a high turnover. - Fully Electronic Machine with ability to set individual prices in an instant. - Accepts all coins from 5c to €2. - Completely eliminates staff consumption of company stock immediately saving you money! - Capacity of 96 tins with 6 seperate selections (16 per selection). - Highly visual, eye catching design with secure T bar locking system.